Welcome to 1702 East Ashley – Bella Vista on Folly Beach! This stunning 4 bedroom, 3.5 bath pet-friendly home is the perfect spot for your family vacation. The home features panoramic views of the Folly River, Cooper River Bridge and Charleston Harbor as well as views of the Atlantic Ocean from the top for deck. The home sleeps 10 comfortable and is the perfect home with a large fenced in back yard leading out to the dock for fishing and crabbing. Located on a quiet end of Folly Beach the home has close beach access and is sure to be a repeat destination for years to come. The main living area starts on the second level and includes the remaining 3 bedrooms and living areas. Featuring hard-wood floors throughout the owners have spared no expense in creating a relaxed coastal feel that reminds you why your chose Bella Vista for your vacation. The master bedroom has king size bed, large flat screen TV and beautiful river and marsh views that provide the perfect backdrop to start your day on Folly Beach. Master bath includes walk-in shower with river stone tiles and the Jacuzzi tub overlooks the dock and Folly River for added relaxation. Second bedroom includes queen size bed, flat screen TV and attached full bath. The bath includes shower/tub combo. The final bedroom on this floor is perfect for the kids with bunk bed setup and flat-screen TV for entertainment. The top floor features open-floor plan with large living area and gourmet kitchen. 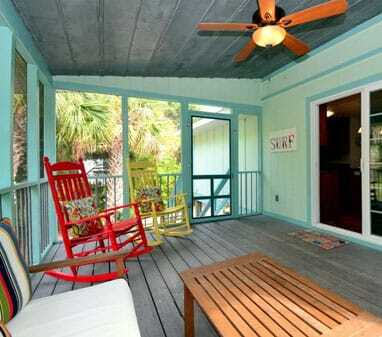 Decks on the front and back of the home feature some of the best views on Folly Beach with Atlantic Ocean views as well as extended views of the Folly River. Living area has pull-out sleeper sofa for additional accommodations and large dining table perfect for the family meal or game night. Entertainment options include flat-screen TV, DVD player and XBOX but the sunset views off of the back deck may be all you need. Kitchen has gas range and all of the amenities even the most discerning family chef would need. Tile counters with breakfast bar area will be great for entertaining and the views out of the kitchen windows will make clean-up duty a welcomed chore. The business traveler even has small office off of living area with desk and privacy to get a few things done. Deck off of the back of the home has stairs all the way to the fenced in yard and lounge chairs to enjoy the sun. Deck off of the master is completely screened and is the perfect outdoor living space any time of the year. Dock off of the back of the home has creek access and is great for crabbing and fishing or just enjoying the sounds of the marsh. Grill out on the gas grill while watching the wildlife and beautiful sunsets over the marsh. The bottom level of the home features a separate Mother-in-Law suite equipped with queen size bed, full bath, full refrigerator, flat-screen TV and all the amenities needed to provide separation and comfort. The bottom level also has one car garage with Ping-Pong table perfect for entertaining on the occasional rainy day. There will be a $125 non refundable pet fee per pet, plus tax, if you would like to bring a furry companion. If you have more than 2 pets, please inquire with us before renting. The home is strictly non-smoking. Requires a minimum age of 25 to rent. No parties or events allowed that exceed the maximum occupancy of the home. Please contact Carolina One Vacation Rentals with any additional questions.